Launched in 2373, the USS Euderion was send into the Dominion War in her first days. Originally commanded by Captain Saraja Brennan, the Euderion was stationed in the first year of the War at the Romulan border to intercept Jem'Hadar Ships who crossed the Neutral Zone. When the War heating up in the second year, Admiral McElroy take over command and used the Euderion as Command-ship for the 8th fleet at the Cardassian borders. As the new heavy hitter of the 8th fleet, the Euderion and her fighter squadrons were able to destroy over 60 Attack ships and 15 Cardassian and Dominion Capital ships in her career. 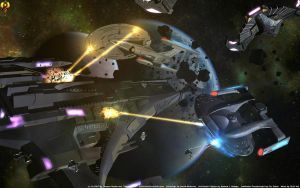 In 2375 the ship was part of the mixed Federation/Klingon/Romulan fleet which attacks Cardassia Prime to end the War. The Euderion was heavy damaged and lost more than two third of her crew in the battle. She needed the following sixth month for repairs in the Drydock facility near Anilak Prime. With the death of Admiral McElroy because of a severe case of mental illness, Captain Ellen Delia take the command of the ship for a comming exploration mission. Beautiful work! Impressive ship indeed. Hey, have you ever done a Husnock ship? Granted only one was ever seen, in just that one episode of STNG, but it was strangely ominous. No, have no Husnock 3d models and never saw someone who made one. I like how you did this piece. One of the best designs we got from the TNG Era and the "First Contact" ships.